Card stock cut at 7 3/8" x 3 1/4"
Score your card stock at intervals of 3 1/8", 3 1/2" and 3 7/8"
Fold card along all center score lines. Cut to the score line at equal intervals as shown in the diagram below. About 1/2" apart. Enough room for a pen or pencil. At this stage you can embellish the cover. Stamp and emboss with celebration sentiments , or simply emboss with your Cuttle-Bug machine. I have done both. 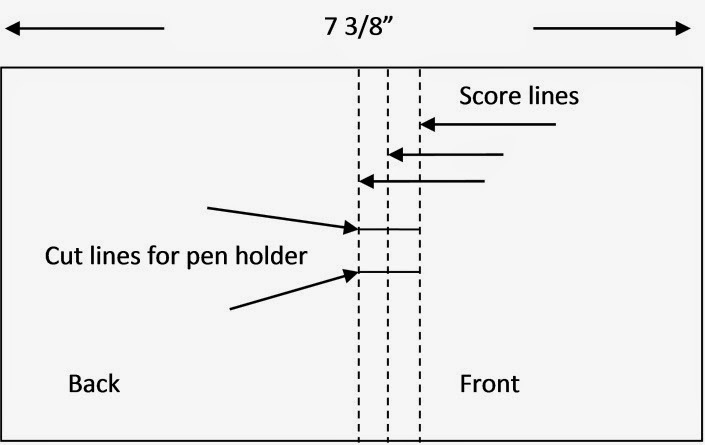 Once completed, fold and score lines so that the pen holder sits proud as in photo. Apply snail adhesive to secure the middle score line to the inside of the back, thus producing a book cover. On the back of your post it notes pack run several lines of snail adhesive and carefully center inside the back panel. There you are, a great economical and practical for for anyone. Especially for those last minute gift ideas. Easy and cheap to create.